A good strategy when fly fishing the Erie tributaries in the spring is to concentrate on the upper halves of these streams or their feeders. The majority of spring steelhead will be found here because of the presence of ideal spawning riffles. Spawning activity can also occur very close to the lake in some of the smaller tributaries. If a tributary has an impassable upstream barrier like a dam or waterfall, spring steelhead will stack up below it. These areas will hold a concentration of pre-spawn, spawning and spawned-out steelhead. 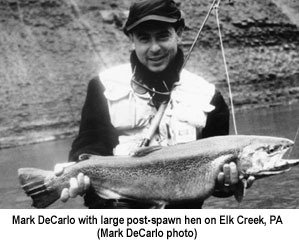 Usually spring steelhead fly fishing requires locating spawning areas. Ideal spawning areas are riffles that are 1 to 4 feet deep which contain dark colored gravel bottoms. Next to these areas are usually deeper runs, pockets, or pools that harbor pre-spawn fish and spawning fish that have been scared off their beds. Prior to spawning, a female steelhead moves into a spawning area and digs out a redd. She does this by turning on her side and making powerful upsweeps of her tail in the gravel. The current washes away loose gravel, forming a saucer-shaped hole that will hold the eggs. Males are attracted by this digging activity and begin competing for spawning rights, with the largest and most heavily kyped males winning out. They use their superior power and large kypes (hooked lower jaws) to drive inferior males from the redd. After the female drops her eggs, about 20 percent of what she is carrying, the dominant male fertilizes them. Sometimes one, or possibly two, sub-dominant males will also participate. The female will then move immediately upstream to begin making another redd. The displaced gravel from this redd covers the previously fertilized eggs downstream. The female continues this process until she is spawned out. When you are fly fishing a spawning bed there are several things to keep in mind. If you don't notice any spawning activity on the bed itself, fish the adjacent deep-holding areas. These areas often hold pre-spawn or spooked spawning steelhead. Fishing on the redds has a simple strategy. Fish for the males or "bucks". They are easy to distiguish from the females, or "hens," because they are almost black, while the females are bright silver. If you catch the female first, the males will quickly scatter. These aggressive males are very territorial. They are not actually feeding, but they will chase flies to dominate the redd. Before fishing, position yourself slightly upstream and to the side of the redd. If the water is less than 2 feet deep you have to be concerned about the fish seeing you. Avoid detection by keeping a low profile by crouching, or if necessary, getting on your knees. Locating yourself next to the redd with brush and trees to your back and wearing drab clothing can also help conceal your presence. Next, cast your fly far enough above the redd so that it can reach stream bottom as it drifts through the redd. Mend your line to maintain a dead drift and keep a tight line so you are able to quickly set the hook. When a male takes your fly he will usually only snap at it, then quickly spit it out. So watch your fly carefully as it drifts through the redd, and set the hook at the appropriate time. If water visibility is good, you should be able to target a specific male. If you do hook a female, you will notice that their takes are much more deliberate. A tandem fly rig of a large streamer or wooly bugger (size 4 or 6) as the point fly (bottom fly), with a smaller egg pattern or nymph as a dropper fly (top fly), works well when drifted over a redd. Spawning steelhead can become intimidated by the larger fly and will move away from it (usually toward you) as it is drifting downstream. When it makes this move it will quickly encounter the egg pattern or nymph which is drifting behind the larger fly. This smaller fly is moving toward a more inside position (where the steelhead has moved) and is often taken by the steelhead. Drifting two smaller tandem flies over the redds is also very effective especially when spawning steelhead seem to be moving constantly on the redds. If a moving steelhead doesn't intercept the point fly he will more than likely encounter the dropper fly as it drifts or swings over another area of the redd. To ensure that the steelhead sees at least one of these flies adjust the distance between the two flies on the leader to correspond with the approximate side to side movement of the fish. Another technique is to stand directly upstream of the redd, without spooking the fish, and drop the fly right down onto the noses of the steelhead. You can sweep the fly back and forth in front of the fish or just hold it stationary. Amazingly, this technique can induce some tremendous strikes from spawning steelhead (especially males). In off-color flows it will be difficult to see the fish on their spawning beds. This is usually the result of spring run-off that causes high, turbid water, or a spawning bed with a dark bottom. You can often spot the brighter females, as they turn on their sides and shake their tails. This action gives off flashes of silver in clear water and gold in murky water. Wearing polarized sunglasses on bright days is a tremendous help in seeing these flashes.Mentally mark this spot in the stream and fish to areas just downstream where the males will be holding. Fishing steelhead spawning beds has its proponents and detractors. In the Pacific Northwest, this practice is strongly discouraged on rivers with wild steelhead because of concern that it is very detrimental to successful spawning. On the other hand Michigan steelheaders, however, seem to have no problem with fishing on the beds, even though 50% of their fish are known to be naturally reproduced. Most of southern Lake Erie's tributaries support steelhead runs which are based on stocking programs, not natural reproduction, so fishing on spawning beds is not a harmful to the fishery. On tributaries like the Cattaraugus River in New York, however, a significant amount of natural reproduction is developing. Here it makes sense to stay away from the spawning beds. This will protect what someday could be a self-sustaining fishery. The Ontario tributaries on the northern shore of Lake Erie support steelhead runs that have been estimated by the Ontario Ministry of Natural Resources to be 90% wild fish. In order to protect this wild steelhead fishery most of Ontario's tributaries are closed during the peak-spawning season. The normal open season for southern Ontario tributaries is April 29 to Septemper 30 with an extended season on most of the major tributaries from October 1 to December 31. 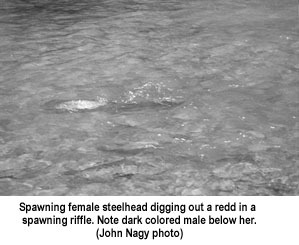 This article is an excerpt taken from the newly revised and expanded 2nd edition of STEELHEAD GUIDE, Fly Fishing Techniques and Strategies for Lake Erie Steelhead by John Nagy. Mr. Nagy is a professional guide on the Great Lakes steelhead streams.